Be sure to head over to CPS this week and check out this weeks sketch. The Sketch sponsor this week is Flourishes. Here's a sympathy card I created using this weeks CPS Sketch and Flourishes images. It's a gorgeous sympathy card, Lisa!!! I love it!!! That's some of my favorite paper and I love that you stamped right on it -- I was *supposed* to be making a sympathy card tonight that I need, but it didn't get done -- wish I could just grab this one -- it's gorgeous!!!! This is lovely, Lisa! The stamp looks so pretty just as an outline on the DP. Wonderful! Beautiful! Luv the way you used the stamp...so creative you are! 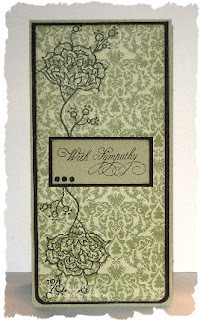 Lisa this is beautiful, a wonderful sympathy card! Very elegant, I love when your creative types stamp on designer paper!!! I always hear myself say "why didn't I think of that". Beautiful, thoughtful card.